"naa marya re seenk-paathri, naa marya re ulhaane-madeene, ja maryra re beta gaibhan ke nydaane"
Village’s ancient roots are linked to village “Mokhra” in Rohtak district. It is said that foundation stone of village’ called “Dada Nagar Kheda” (picture to right-side) was laid some 300 years ago (exact age of the village is yet to confirm). It is believed that ruins of houses of ancestors of Nidana can still be seen in Mokhra village. There is no statue inside this holistic symbol and is the oldest whoshiped memory of village. village’s Khap was the biggest deciding body during that period in deciding for whom the village warriors would fight, so they fought and won many wars and revolutionary battles on Khap’s referrals. As it is common in Haryana villages to find minimum one or many freedom fighters, Nidana also proudly boasts of its son. Late Choudhary Santa Singh Malik who was one of the prominent freedom fighters. He served in Indian National Army of Neta Ji Shubhash Chandra Bose. His respect and salutation to Neta Ji & love and passion for country always reflected from his attire he was proud of wearing, the logo of INA and Neta Ji on his chest all the times (NH would love to enlist all such heroes of village so if you know another such warrior from village please share with us). Elders of village say that though the warriors were across all castes of village but main contributors had been from Jats and Kabirpanthies (Harijans). Lajwana Gadar and Nidana: During the drought of 1853, people were dying of starving. And even after being aware of this pitiable condition of hapless public; the then king of Jind enforced public for tax collection. It sparked intolerable wave of anger and opposition from public, which brought two life-long enemies but legends at one platform to combat for the protection of public interest. How this revolution took through 1853 to 1863, its going out of control during 1857’s first freedom revolt, what were its post 1857 affects, how legendry Bhura and Ningaahiya took on king, how Nidana settled down the things, all is coming soon in a full article. Arya-Smaaj and Nidana: In 1875 when Swami Dayananda Sarswati establishment Arya Samaaj, he heavily critisized and opposed the worship of scluptures and statues, which attracted the farming and peasant community of Haryana, Dilli and Western U.P. because most of them believe in unity of God and believe that God's abode is one's own soul rather than any building made up of iron and cement. So ultimately Arya Smaaj got a huge acceptance among them and consequently same happened in Nidana. Ultmately Nidana in no time became one of the biggest followers of principles of Arya Samaaj. For the fraud saints and beggers Nidana is graded as "Saand chhod rakhya sai" means they say that if you go to Nidana in hope of getting something on name of God or false manipulations then you will get a minimum treatment which is enough to teach you the importance of earn by hard work. Nidana saw various anti-drug revolutions in past and recently in late 90s and early 00’s under the leadership of her own son “Swami RatanDev Sarawati” who also established the present day very famous Gurkul for Girls in Kharal village with a vision of empowering girls by providing them quality Vaidik & contemporary education. You can read more on village and its affiliation to Arya-Samaaj on “Culture” page. 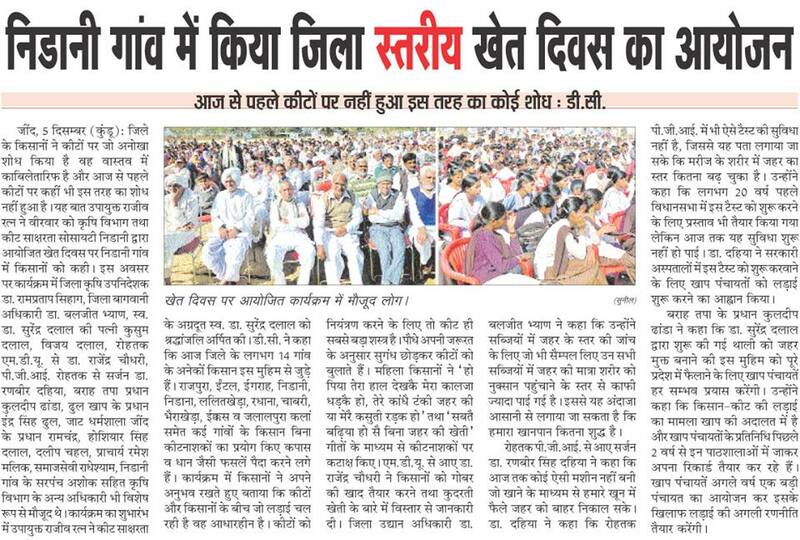 Village till date is counted as having largest number of followers of principles of Arya Samaaj in Haryana. Nidana Protection Force (Pahalwan Dasta): In old ages there were many dacoits and "Dhaads", who used to loot the villages like us. Us because we are known as "Gaibh" means one who live at one place and earns by hardwork. So to protect the village' interest and property, our village boasted of having its own protection force i.e. Pahalwan Dasta. This protection force was majorly constituted of Kabeerpanthi community of village and worked under the guidance of Jats (majorly) mutually with Kabirpanthies. They were welcomed like heroes each time after returning as winners from battlefield. But now as time has changed so it has also become the part of history. After the independence of India on 15th August 1947, one year later on 15th July, 1948 the independent Kingship of Jind estate was dissolved into PEPSU (Patiala and East Punjab States Union) and formally became the state of India in 1950; on the same pattern as other 563 emperor states were dissolved into one constitution of India. Later on in 1956 PEPSU was merged with Punjab, consequently village fell under the Punjab State and remained the part of Sangroor district until the formation of Haryana on 1st November 1966. After the renaissance of Haryana from Punjab, Nidana came under district Jind (one of seven districts of the newly reformed Haryana). Villagers have been making it big in defense services, two nationwide green and one white revolution, agro-business and sports passionately. Current trend taking to: Now a day’s village youth is equipping themselves with and entering in technical, research and modern management fields. Recently the women of village are making it big by leading the anti-pesticides agro revolution. You can read more about this revolution under “Agriculture” page. Note: Thanks for helping NH in enlisting the freedom fighters; soldiers who laid their life for nation or have taken part in any of the wars for India and all such unknown warriors of village across castes and religions. Nidana Heights (NH) would love to tribute its sincere salutation to them by bringing their story to world via this website. Late Swami RatanDev: You gave Kanya Pathshala to village. Late Rapmal Shastri Ji: You brought Old Boy School in village. Late Choudhary Dada Jaagar Singh Malik: Land donators for Boys Old School. Late Choudhary Dada Prhlaad Singh Malik: The most brave hearted legend of village ever heard of, who had the dare and mind to turn the mouth of horse ridden armies (Locally called as "Dhaad") single handedly. 17 donors of rooms for Kanya Pathshala. Read in detail about these legends on “Culture” and "e-Media" page.